Daily Announcements | | Together, building a wonderful school community. At 9:00 AM every morning, notices by staff and School Council are read aloud to the school over the PA system. These are Tuesday’s announcements. (Ms Jarvis & Mr Sekdorian): Take Action is at lunch today. We hope to start the weaving of all those milk bags today. Come after you’ve eaten your lunch. (Ms Prince): Concert Band will meet today at lunch. (Brewster): Gr 7/8 boys soccer team – Team Celebration day! Please meet in Mme Brewster’s room at lunch. See you there. (Mr Hopkin): Please remember at lunch the Youth Health and Wellness team meet in Room 311 at lunch time for important training. (Mme Froese): The Jr Boys volleyball team played their second game at Adam Beck last night. Good play by all and loss in second game with a score of 26-24 for Adam Beck. Good luck tonight boys! See you at practice today at 11:45. Snack Program – Thank you to everyone who responded to our call for volunteers! At this time, Snack Program would appreciate donations of paper towels and dish soap. Please leave at the office with “Snack Program” clearly marked. Sponsorships! Time is running out to be a sponsor of our Bowmore Carnival. Our Carnival banner will be displayed at the front of the school and will list our sponsors. A tax receipt is available for donations over $25. If you would like to be included, please email bowmorecarnival@gmail.com. A friendly reminder from the Health & Phys. Ed. offices! Thank you to all of you who took the time to participate in the recent Parent Survey. The results are in and will be used to build a budget proposal for next year. The results of the survey and the budget proposal will be presented at the next School Council Meeting on Wednesday June 6th. 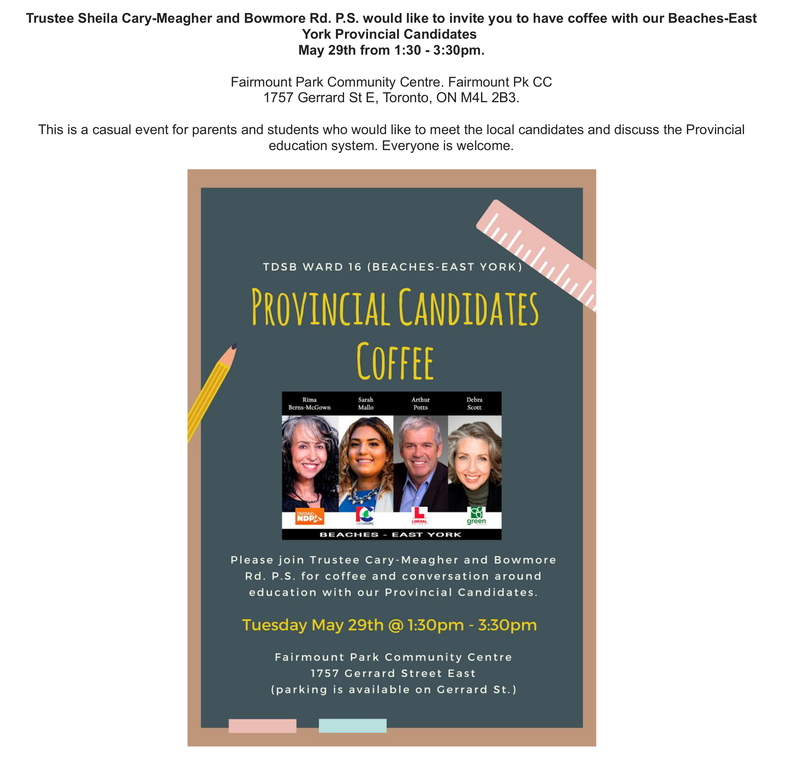 Tuesday May 29: Provincial Candidates Coffee @ Bowmore. Parent and teacher survey results, and budget proposal, will be presented at this meeting. Pizza and babysitting are available. 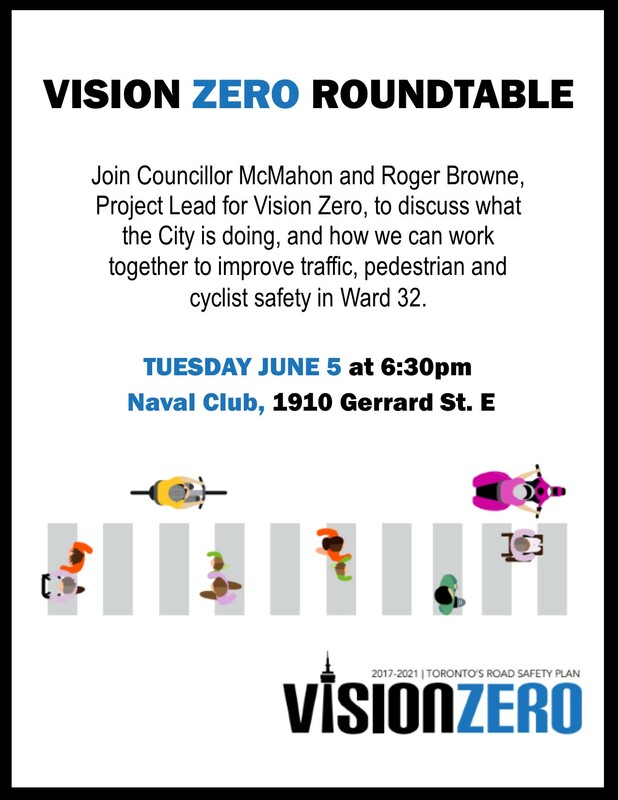 If you will be bringing children, please RSVP to bowmoresc@gmail.com so that we can arrange for enough supervision. Download the minutes from the last Council meeting via this link. Friday June 8: Last day of Read-a-thon. The class that reads the most books will win an Ice Cream Party! Read more here. Due to the low number of subscribers and views of the blog posts on this web site, we are moving to posting day-to-day descriptions and events only on Facebook. This site will continue to post copies of forms, minutes of meetings, and other content that is more static. We encourage anyone who is not currently on Facebook to consider joining because a lot of information is shared on the Bowmore School Council page. Council Facebook Page. Facebook not your thing or you prefer emails? There’s a new option this year: per-classroom communication. 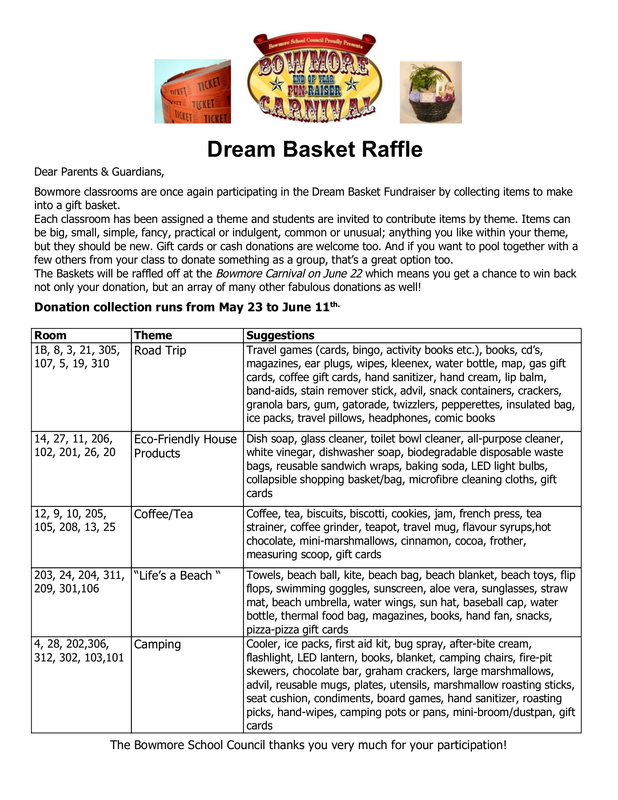 Each class has one parent volunteer who forwards information from Council and the teacher. Those who sign up will receive this email once a week. If you are interested, please email bowmoresc@gmail.com and attach a copy of the consent form. If you do not sign up then you will not get the emails. Some people choose to both follow Facebook and receive the classroom emails. It’s up to you. 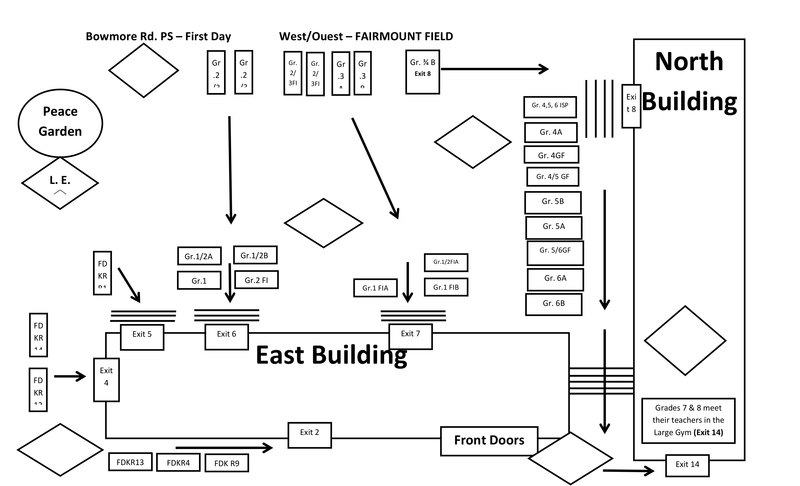 The attached map outlines the general areas where each grade will line up on the first day of school. Teachers positioned in these areas will help direct students to their appropriate line-ups. If you have not already obtained your child’s class number please look for support staff wearing orange vests – they will have class list information to share. Teachers for grades 1 through 6 will be on the back paved area of the school and will all be holding up signs. On the south end of the school. Teachers will be in both play yards to assist you. As usual, the first day of school is always a busy time but these measures should help kids find out where they need to be. For those who are interested, the results of the survey are in and a majority voted for Friday. Friday received more than twice as many votes (48) as the other four days of the week combined (20). “Doesn’t matter” had 5 votes.